Yngwie J Malmsteen first came to rock fans notice when he contributed to the first Alcatrazz album with Graham Bonnet on vocals. Influenced by Hendrix and more especially Ritchie Blackmore, Malmsteen further developed Blackmore's neo-classical style in the eighties debuting as a solo performer on 'Rising Force' in 1984. It was not until 1988's 'Odyssey', co-written with Joe Lynn-Turner, that Malmsteen fully harnessed his 'master of twiddly' style to hard-edged melodic rock songs. 1990's 'Eclipse' changed vocalists, this time Goran Edman stepped up whilst Malmsteen handled composing duties. Edman had appeared previously in Europe guitarist John Norum's band. 'Eclipse' is often overlooked in terms of the Malmsteen canon and against some of the other classic melodic rock albums of the period. In truth, the standouts are standouts, there is some filler, but overall it is a worthy successor to 'Odyssey' and demands re-evaluation. It does, however, seem to divide Malmsteen fans, many of whom feel the guitarist's best work was created in his core albums of the 1980s, notably 1986's 'Trilogy'. And, in 'Save Our Love' - horror of horrors - he actually included another ballad (also a single). The first two tracks are effectively some of the best hair metal you're ever likely to hear. 'Making Love' is a wonderful blend of rousing chorus and guitar metal (an extended version was released as a single) whilst 'Bedroom Eyes' features a superbly dynamic riff and chorus with Malmsteen wah-wahing to the finish. Eclipse was a completely digital recording and the dynamics - not least powerful drumming - are beautifully captured. The rest of the album fails to sustain the sheer unbridled momentum of the opening two tracks but the remaining pieces do repay repeated visits. In anyone else's repertoire I am sure they would have shone like diamonds, but against the previous offerings (Odyssey and Trilogy) and Malmsteen's own high standards they probably pall into melodic rock clich� for some. Some fans were not over-impressed with Goran Edman, either. At times he sounds like Lou Gramm in Foreigner and lacks the range of his predecessor Joe Lynn Turner. But this is mere bitching: check out 'Save Our Love', 'Motherless Child' and 'Judas' for proof of his credentials. 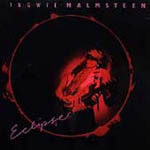 'Eclipse' marked a Malmsteen in transition, the next official release was a compilation and it wasn't until 1992's 'Fire And Ice' that he regained his direction in the face of changing musical taste, notably the advent of grunge. From thereon, Malmsteen's aspirations of further commercial success went downhill. © 1990 Polygram Inc. All rights reserved.